Stories are powerful ways to communicate deep things of the human experience in a way that touches us and makes us more human. Jesus is the perfect example of being a master storyteller, making His truth and teachings relatable and personal. We discuss how we can open our spiritual eyes to stories and movies to see how they speak of the bigger story of salvation and the longings of the human heart. We also share about how our owning our stories is key. 1) What is your favorite story or movie that has parallels with the story of Salvation? Why do you love it so much? 2) Do you relate to the quote “for most of us, life feels like a movie we’ve arrived at 45 minutes late”? How connected to you feel to the larger story of Salvation in your daily life? 3) Have you ever wanted to take the pen out of God’s hand and write your own story? How do you need to grow in trust that He writes the best stories? 1) What do you think is your role to play right now in the story of Salvation? 2) What movies or books do you love? How do those relate to the Story of Salvation? 3) How are you pursuing truth, beauty, and goodness in the stories and movies you consume? 4) What are three themes of your life story? What does God want to say about that? The Lion, The Witch, and the Wardrobe Book Club Begins January 21! Hey friends! 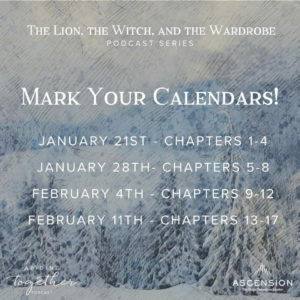 As we announced, we will be doing a book study/podcast series on The Lion, the Witch, and the Wardrobe. Here’s how it will work. Each week there will be a podcast discussion about the chapters for that week. We will chat about the themes, the deep spiritual significance and how it impacts us all on a personal level. It’s best if you can read the chapters before listening to the podcast, but don’t stress out about this. We want you to enter in however you wish and not feel burdened or guilty. You don’t have to even read the book and you can still participate with the podcast. We will provide discussion and journalling questions in the show notes for you each week, so you can dive deeper with friends or on your own. Also, we will be having continuing discussions on our Private Facebook Group, which we would love for you to join. Just request access by clicking this link. We are so excited to go on this adventure with you. Please share this with your friends…heck, you can even share it with your enemies! This is going to be so fun. Abiding Together is a weekly podcast hosted by Michelle Benzinger, Sr. Miriam James Heidland, and Heather Khym. 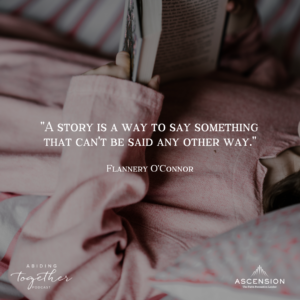 If you would like to contact the ladies of Abiding Together, email: abidingtogether@ascensionpress.com.